Notice how the large flat slabs are located where people /carts would cross the alley. Cincinnati still has some excellent alleys, and this is a beautiful illustration. One thing the city recently did right was to re-use granite curbing to surround the islands in the widened Cutter Street and Laurel Park Drive. I didn't notice that, but I suspect it must be pretty expensive to install new. Thanks for reading and commenting Radarman. I was wondering if anyone read this, so I just put a counter on and I'll soon find out. Agreed - very nice comments Mike. I live in Pendleton and notice these little things all the time in our neighborhood. Speaking of alleys and pavement - have you ever noticed the wood used to pave the alley just north of the Davis Furniture building on Main Street. Not sure what this alley is called, but it connects Main to Clay. 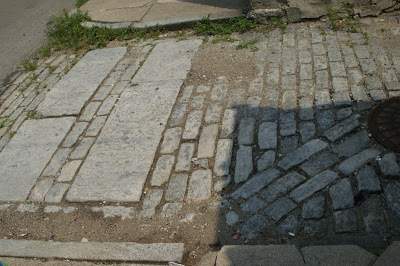 The portion of the alley closest to Main still holds its originally wood paving...I wish it would be restored!